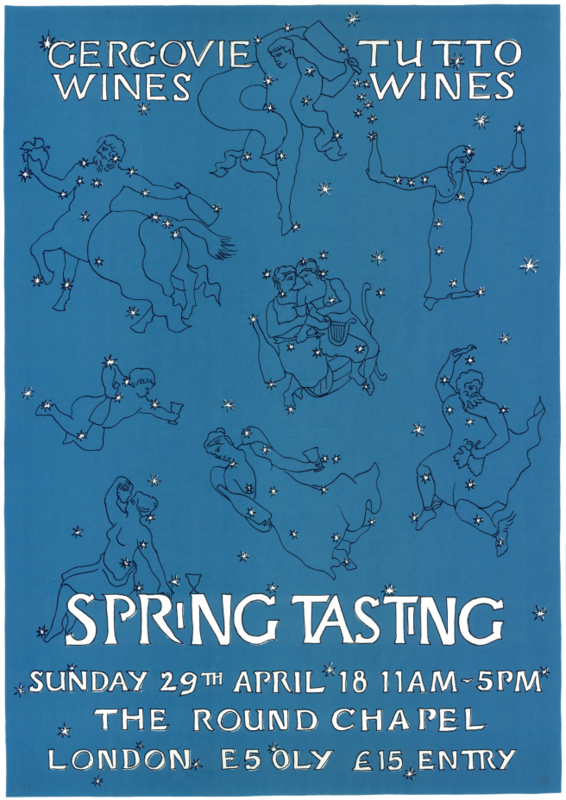 On Sunday 29th April we are teaming up with our friends Gergovie Wines to host another Spring Tasting. This is always the highlight of our year and we hope you can join us for what promises to the best yet. The tasting will once again be taking place in the wonderful surrounds of Hackney’s Round Chapel from 11am-5pm. Tickets are £15 and can be bought on the day. This buys you a tasting glass and the opportunity to taste and chat all day with some of Europe’s most characterful growers. There will be coffee and pastries from Browns of Brockley, lunch by 40 Maltby Street and beer from The Kernel, along with a handful of Harry and Anna’s prints and t-shirts for sale. It doesn’t end there. This year the after party will be taking place at the Total Refreshment Centre in Dalston. Hosted by our friends from Brilliant Corners, from 6pm till 2am they will be doing what they do best. You’ll be able to enjoy wines from the growers at the fair, delicious Japanese food and sweet music all night long. Entry to the after party is free, but please remember to bring your glass from the tasting as this will be your vessel for the night!